Blood enters the heart through the inferior and superior vena cava on the right, emptying oxygen-poor blood from the body into the right atrium. On the left, the pulmonary vein empties oxygen-rich blood from the lungs into the left atrium. Blood then flows from the right atrium into the right ventricle through the tricuspid valve. When the ventricles are full, the tricuspid valve shuts and the ventricles contract. 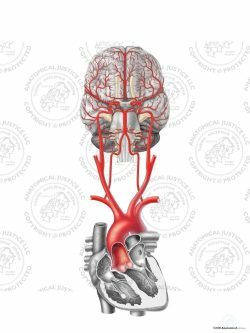 On the left, blood flows from the left atrium into the left ventricle through the mitral valve. When the ventricles are full, the mitral valve shuts and the ventricles contract. Next, blood leaves the heart through the pulmonary valve, into the pulmonary artery and onto the lungs. On the left, blood leaves the heart through the aortic valve, into the aorta and onto the body.